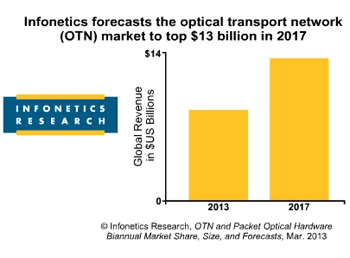 The OTN transport and switching equipment market grew 8% in 2012 to $7.3 billion and is expected to reach $13 billion by 2017, according to a new report from Infonetics. Tellabs and Fujitsu together hold the lion’s share of the P-OTS market as a result of their aggressive deployments at Verizon, while Ciena, Cisco, and Alcatel-Lucent remain in a tight 3-way horse race. 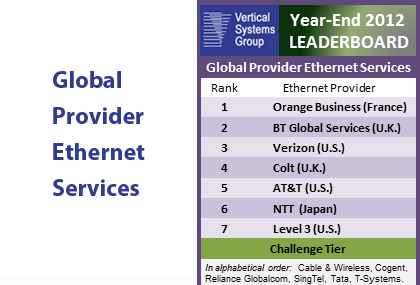 Vertical Systems Group reported a realignment of carriers in its Year End 2012 Global Provider Ethernet Leaderboard, as BT Global Services surged forward to challenge Orange for market leadership. Market shares are calculated using the base of enterprise Ethernet services installations, plus input from Vertical's surveys of Ethernet providers throughout the world. "As we forecasted in our mid-year readout, the final 2012 Global Provider Ethernet market share results show a realignment at the top of the Leaderboard," said Rick Malone, principal at Vertical Systems Group. "Orange remains the market leader, however BT Global Services gained significant share to move up to second position ahead of Verizon and Colt. The outlook throughout 2013 is heightened competition for market share in this demanding customer segment." For year-end 2012, the Challenge tier companies are the following (in alphabetical order): Cable & Wireless Worldwide (U.K.), Cogent (U.S.), Reliance Globalcom (India), SingTel (Singapore), Tata Communications (India) and T-Systems (Germany). Moving up from the Market Player to the Challenge tier during 2012 were Cable & Wireless, Cogent and SingTel. The Market Player tier covers all other Global Providers selling Ethernet services throughout the world. Service providers in the Market Player tier include the following companies (in alphabetical order): Airtel (India), Bezeq (Israel), CAT Telecom (Thailand), CenturyLink (U.S.), China Telecom (China), China Unicom (China), Easynet Global Services (U.K.), Embratel (Brazil), euNetworks (U.K.), Exponential-e (U.K.), Globe (Phillipines), GlobeNet (Brazil), GTS (Poland), GTT (U.S.), Interoute (U.K.), KDDI (Japan), Korea Telecom (Korea), KPN International (Netherlands), Masergy (U.S.), PCCW Global (Hong Kong), PLDT (Phillipines), StarHub (Singapore), Swisscom (Switzerland),Telecom Italia International (Italy), Telefonica Worldwide (Spain), Telenor (Norway), TeliaSonera (Sweden), Telkom Indonesia (Indonesia), Telkom South Africa (South Africa), TelMex (Mexico), Telstra (Australia), Telus International (Canada),Time (Malaysia), TM (Malaysia), Vector (New Zealand), Zayo Group [includes AboveNet] (U.S.), and others. 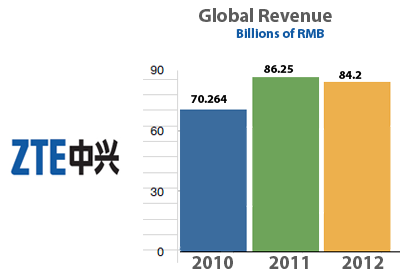 ZTE reported 2012 annual of RMB 84.2 billion, representing a decline of 2.4% for 2012. In China, revenue of RMB 39.6 billion was stable compared to a year earlier, accounting for 47% of the company’s total. Overseas revenue dropped 4.5% to RMB 44.7 billion, representing 53% of the company’s total The company recorded a net loss attributable to shareholders of listed company of RMB 2.84 billion. ZTE posted positive operating cash flow of RMB 1.87 billion. In 2012, ZTE recorded positive free cash flow for the first time in three years. In 2012, ZTE saw an improvement in its business mix. Combined revenue for Europe and the Americas increased 1.6% from a year earlier, after strong growth in sales in the United States market. In the Asia Pacific market, revenue increased 2.8%. In the network infrastructure division, the company shifted towards higher-margin business. In the terminals division, the mix shifted towards smart devices. Network infrastructure sales were RMB 41.6 billion. Terminal sales were RMB 25.84 billion, in line with the company’s target. Software and services sales were RMB 16.8 billion. Despite the pressure on its operations in 2012, ZTE boosted spending on research and development by 4% to RMB 8.83 billion. The company noted that it ranked first in international patent applications by the World Intellectual Property Organization in each of the past two years, and was the first Chinese company to reach the Top-10 in patent applications to the European Patent Office. A plugfest for equipment implementing ITU-T G.vector for VDSL2 attracted fifteen vendors earlier this month in Durham, New Hampshire. The interoperability testing event, which was organized by the Broadband Forum and hosted by the University of New Hampshire InterOperability Laboratory (UNH-IOL), was focused on detailed testing of G.vector functionality. The participating companies were Actiontec Electronics, Inc., ADTRAN, Alcatel-Lucent, AVM GmbH, Broadcom, Calix, Cisco, EXFO, Ikanos, JDSU, Lantiq, Metanoia Communications, NETGEAR, Real Communications and Technicolor, with the support of Telebyte and TraceSpan Communications. "There is no doubt that VDSL2 has a pivotal role to play in the future of high speed broadband services. It is rapidly becoming a widely deployed technology and the addition of G.vector functionality is helping to achieve the increased bandwidth needed for today’s applications and consumer expectations. Our role is to ensure that implementations of G.vector are interoperable and perform well, and the plugfest is a key step towards that goal," stated Robin Mersh, CEO of the Broadband Forum. Fujikura Ltd. announced the world's first 40-60 Gbps silicon photonics modulator in both Quadrature Phase-Shift Keying (QPSK) and Differential QPSK (DQPSK) versions. The modulator comprises two silicon phase-shifters that are integrated in a nested Mach-Zehnder configuration. The company optimized electrode arrangements and doping profiles in the phase-shifters, which materializes high-speed performance of >40 Gbps DQPSK and >60Gbps QPSK modulation at less than 10dB fiber-to-fiber loss. Moreover, dispersion tolerance of more than +/-80 ps/nm is recorded at the 44.6 Gbps DQPSK transmission. The NTT Innovation Institute will pursue the development and provisioning of highest-grade information security and cloud computing technologies. NTT I3 will initially focus on promoting the development of services tailored to the North American market. Best practices concerning intellectual property solutions applied in a modular format in North America will be rolled out globally, including Japan and emerging countries. 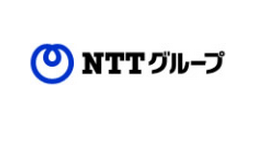 "Establishing a new R&D center in North America will enable NTT and its group companies to quickly develop intellectual property tailored to the specific needs of the most rapidly-changing market in the world," said Hiroo Unoura, President and CEO of NTT. "The NTT Group is committed to accelerating global business expansion in order to provide value-added services to its customers." Digital Realty Trust acquired a 120,000 square foot data center development property in Markham, Ontario (Canada), approximately 17 miles north of Toronto's central business district. The facility is capable of supporting approximately 5.4 megawatts of IT load. The purchase price was C$8.65 million. "We have been tracking a significant amount of demand for enterprise-quality data center space with very limited supply in the Toronto market," said Michal F. Foust, chief executive officer of Digital Realty. "The acquisition of this property expands our existing footprint and enables us to support our customers' data center requirements in the Toronto market." Lockheed Martin is establishing a Silicon Valley Alliance aimed at helping innovative companies in the region meet the diverse technology needs of the federal government. The goal is to provide the federal government with greater visibility into innovative technology solutions developed in Silicon Valley, especially software and cyber security solutions. "Lockheed Martin has played an ultra-high-tech role in the Silicon Valley story since 1956 when we opened our facility in Sunnyvale, adjacent to Moffett Field," said Tory Bruno, Lockheed Martin's president of Strategic and Missile Defense Systems. "The government market catalyzed the initial growth of all high-tech industries in the San Francisco Bay Area. 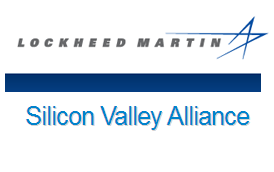 Now, through the Lockheed Martin Silicon Valley Alliance, we can help to reconnect today's companies to that market, which continues to be substantial despite a challenging economy." Mobile TeleSystems (MTS), the leading telecommunications operator in Russia and the CIS, and VimpelCom announced a joint bid to acquire Tele2 Russia, a subsidiary of Tele2 AB, for between US$ 4.0 - 4.25 billion, including US$1.15 billion of net debt. This represents a premium of up to 30% for Tele2 AB and its shareholders relative to the equity value of the recently announced offer from VTB Capital. would like to express our strong interest in providing an alternative offer to the shareholders of Tele2 AB and we think this is a distinctly more attractive proposal. We remain convinced that we can create vastly superior value for your shareholders and would be prepared to enter into discussions immediately with the aim of being able to conclude a transaction within a short timeframe and hence deliver the sort of transaction certainty we imagine Tele2 would be seeking." Metaswitch Networks opened a new product development facility in Cambridge, UK. Located in the heart of the University of Cambridge, the new Metaswitch office will house current employees, new recruits and interns.